While the Aquia and Potomac Districts ceased to exist by the spring of 1862, the need remained for military organization in the Valley throughout the remainder of the war, and the Valley District remained in place for the duration of the war. The name Army of Northern Virginia referred to its primary area of operation, as did most Confederate States Army names at the time. The Army originated as the (Confederate) Army of the Potomac, which was organized on June 20, 1861, from all operational forces in northern Virginia. On July 20 and July 21, the Army of the Shenandoah and forces from the District of Harpers Ferry were added. Units from the Army of the Northwest were merged into the Army of the Potomac between March 14 and May 17, 1862. The Army of the Potomac was renamed Army of Northern Virginia on March 14. The Army of the Peninsula was merged on April 12, 1862. Robert E. Lee's biographer, Douglas S. Freeman, asserts that the army received its final name from Lee when he issued orders assuming command on June 1, 1862. However, Freeman does admit that Lee corresponded with Joseph E. Johnston, his predecessor in army command, prior to that date and referred to Johnston's command as the Army of Northern Virginia. Part of the confusion results from the fact that Johnston commanded the Department of Northern Virginia (as of October 22, 1861) and the name Army of Northern Virginia can be seen as an informal consequence of its parent department's name. Jefferson Davis and Johnston did not adopt the name, but it is clear that the organization of units as of March 14 was the same organization that Lee received on June 1, and thus it is generally referred to today as the Army of Northern Virginia, even if that is correct only in retrospect. In addition to Virginians, it included regiments from all over the Confederacy, even those as far away as Georgia, Texas and Arkansas. Of those, one of the most well known was the Texas Brigade, made up of the 1st, 4th, and 5th Texas, and the 3rd Arkansas, which distinguished themselves in numerous battles, perhaps most notably during their fight for the Devil's Den at the Battle of Gettysburg. 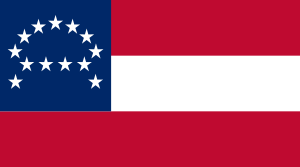 The 50th Georgia Volunteer Infantry are Georgia's most famous contribution to the army. The first commander of the Army of Northern Virginia was General P.G.T. Beauregard (under its previous name, the Confederate Army of the Potomac) from June 20 to July 20, 1861. His forces consisted of six brigades, with various militia and artillery from the former Department of Alexandria. During his command, Gen. Beauregard is noted for creating the battle flag of the army, which came to be the primary battle flag for all corps and forces under the Army of Northern Virginia. 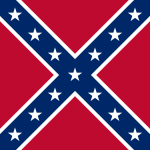 The flag was designed due to confusion during battle between the Confederate "Stars and Bars" flag and the flag of the United States. Beauregard continued commanding these troops as the new First Corps under Gen. J. E. Johnston as it was joined by the Army of the Shenandoah on July 20, 1861, when command was relinquished to General J. E. Johnston. The following day this army fought its first major engagement in the First Battle of Manassas. With the merging of the Army of the Shenandoah, Gen. Joseph E. Johnston took command from July 20, 1861, until May 31, 1862. Under the command of Johnson, the Army immediately entered into the First Battle of Manassas. On October 22, 1861, the Department of Northern Virginia was officially created, officially ending the Army of the Potomac. The Department comprised three districts: Aquia District, Potomac District, and the Valley District. In April 1862 the Department was expanded to include the Departments of Norfolk and the Peninsula (of Virginia). Gen. Johnston was eventually forced into maneuvering the Army southward to the defenses of Richmond during the opening of the Peninsula Campaign, where it conducted delay and defend tactics until Johnston was severely wounded at the Battle of Seven Pines. The army was very briefly commanded by Maj. Gen. Gustavus Woodson Smith on May 31, 1862, following the wounding of Gen. J. E. Johnston, while President Jefferson Davis drafted orders to place Gen. Robert E. Lee in command the following day. On June 1, 1862, its most famous and final leader, General Robert E. Lee, took command after Johnston was wounded, and Smith suffered what may have been a nervous breakdown, at the Battle of Seven Pines. In the first year of his command, Lee had two principal subordinate commanders. The right wing of the army was under the command of Lt. Gen. James Longstreet and the left wing under Lt. Gen. Thomas J. "Stonewall" Jackson. These wings were redesignated as the First Corps (Longstreet) and Second Corps (Jackson) on November 6, 1862. Following Jackson's death after the Battle of Chancellorsville, Lee reorganized the army into three corps on May 30, 1863, under Longstreet, Lt. Gen. Richard S. Ewell, and Lt. Gen. A.P. Hill. A Fourth Corps, under Lt. Gen. Richard H. Anderson, was organized on October 19, 1864; on April 8, 1865, it was merged into the Second Corps. The commanders of the first three corps changed frequently in 1864 and 1865. The Cavalry Corps was led by Maj. Gen. J.E.B. Stuart. It was established on August 17, 1862, and abolished on May 11, 1864 (the day Stuart was mortally wounded), with cavalry units being assigned to the headquarters of the Army. The Reserve Artillery was commanded by Brig. Gen. William N. Pendleton. On April 9, 1865, the Army of Northern Virginia surrendered to the Army of the Potomac at Appomattox Court House, effectively ending the Civil War, with General Lee signing the papers of surrender to General Ulysses S. Grant. The day after his surrender, Lee issued his Farewell Address to the Army of Northern Virginia. The Military district of Northern Virginia was embattled on October 22, 1861. The commander was General Joseph E. Johnston. The military district consisted of three defence districts. On February 28, 1862, there were 47,617 soldiers present for duty to the military district. The Cavalry Brigade was provided from the Potomac's Military District and under direct control from the Defense District. The artillery formed an Artillery Corps with 109 cannons. At the outset of the Peninsula Campaign the Army of Northern Virginia had more than 55,633 soldiers. The cannon was assigned to the brigades, as well as the Reserve's artillery. Nominally, Jackson's Corps in the Shenandoah Valley, was subordinate to the Army. Since Jackson led his own campaign at the time of the Peninsula Campaign and was not under Lee's direct command this overview does not include his three divisions. The Army's organization soon proved inept in the course of the Peninsula Campaign. The corps-like structure was rearranged before the Seven Days Battle to converge with the requirements of actual command. In the course of this battle the Army featured two Corps; Jackson's and Magruder's, with four and three divisions respectively, and three actual divisions with five to six brigades. Also the Defense District of North Carolina answered directly to the Army as well as the Reserve Artillery with six battalions and the cavalry with six regiments. The army's complete strength was about 90,000 soldiers. The exact strength cannot be determined, because only a few notes for actual provisionings survived. The estimated strength results, if not explicitly noted, from in-battle dispatches. The Seven Days Battle showed the Army still suffered from insufficient organization in army command. General Lee subdivided the army again, but this time only with single commands. He introduced a corps-like structure of command, and as an intermediate army management he named the left and right wing. The Army was organized on August 28, 1862 as follows. The Army's Reserve Artillery consisted of one regiment and two battalions. They stayed in the area of Richmond in the course of the whole Northern Virginia Campaign and only returned on September 3, 1862 to the Army. Major General Hill's Division also remained in the eastern parts of Richmond with the order to bind McClellan's attention as long as possible. As it became predictable that the Army of the Potomac would soon be transferred to support Pope, Lee ordered the Division north. Hill never entered battle in the campaign. A total of about 54,000 soldiers saw action throughout the campaign. The Army's losses before and following the Battle of Second Manassas needed to be replaced before the Maryland Campaign could commence. While fundamental changes in the Army's command structure were not necessary, General Lee exchanged divisions and brigades or added additional strength to some. The wings of the Army were now officially called 'Corps'. In the Maryland Campaign the Army was subdivided as follows. While organization of the corps was found to be generally reliable, the corps' subdivision into four or five divisions hampered overall ease of command. General Lee had already considered before the Battle of Antietam to slim down the overall structure, but intended there be no changes in leadership. The Confederate Congress authorized the establishment of the Corps, and President Davis affirmed the assignment of the commanders and promoted Major Generals Longstreet and Jackson to Lieutenant Generals. General Lee announced this in Special Order 234 on November 6, 1862. About 60,000 soldiers served at the Maryland Campaign. Lee took Jackson's death as an opportunity to subdivide the North Virginia Corps again. President Jefferson Davis agreed to the subdivision and ordered Lee in his Special Order Nr. 146 to reorganize the Army. Lee ordered the artillery battalions of the Reserve Artillery to serve directly with the Corps for the duration of the Gettysburg Campaign. The Army of Northern Virginia now comprised a total of 75,054 soldiers at the Battle of Gettysburg. The army fielded more than 241 cannons following the Battle of Gettysburg. The artillery battalions were merged into the Artillery Reserve again following the end of the campaign. On September 9, General Lee had to dispatch the First Corps to Braxton Bragg's Army of Tennessee. Following this the army was resubordinated again. Changes were not significant; only the cavalry saw important reorganization. The Army's strength was then 55,221 soldiers. The changes in command until December 31, 1863 were only minor. Cooke's Brigade was assigned to serve with Heth's Division, Hampton's Division grew by a cavalry brigade and the Third Corps gained an additional artillery battalion. Imboden's Command remained at Shenandoah Valley and was taken over by Major General Early as the Defense District of Shenandoah Valley. The strength of the army was 54,715 men on December 31. The organization of the Army of Northern Virginia did not change until the end of the war. The Army featured several corps, the corps featured several divisions, and the artillery was divided between the corps. The strength of the Army grew in the first six months from about 46,380 to 62,230 soldiers. The army was assigned in July to the Defense District of North Carolina and Richmond. In the course of the Richmond-Petersburg Campaign the number of soldiers temporarily grew to 82,633 while parts of the Army were under the command by Lieutenant General Early in Shenandoah Valley. In 1864 the Army of Northern Virginia fought against the more than twice as strong Potomac-, James- and Shenandoah Army in Grant's Overland Campaign, Early's Raid against the Baltimore and Ohio Railroad, the Richmond-Petersburg Campaign, and Shenandoah Campaign in the Shenandoah Valley. The Army's organization for January 31, 1865 because 69,659 soldiers were fit for battle, but a minimum of 4,500 had no rifles. Following Lieutenant General A.P. Hill's death on April 2, 1865 the Third Corps was dissolved and assigned to the First Corps. On April 9, 1865, General Lee surrendered. One day later he thanked his men and his officers for their bravery and sturdiness and announced the dismissal of all troops on their word of honor in General Order No. 9. The listings of the Army of Northern Virginia say that 28,231 soldiers were dismissed on their word of honor on April 10, 1865. The Army of Northern Virginia is one of the most respected military formations in American history. Although usually outnumbered, it won victories in the American Civil War at Fredericksburg, Second Manassas, Chancellorsville, and Cold Harbor. Additionally, it successfully drove the Army of the Potomac away from the "gates" of Richmond in the Seven Days Battles, effectively ending McClellan's Peninsula Campaign in 1862. The army held out against long odds in the 1864 Overland Campaign and the Siege of Petersburg, inflicting grievous casualties on the opposing forces of Grant. These successes sometimes gave the army a psychological advantage over its enemies. However, the army was most defined by its commander, Robert E. Lee. To this day, the army and Lee are famed in Southern culture. ↑ 1.0 1.1 Eicher, pp. 889-90. ↑ Freeman, Vol. II, p. 78 and footnote 6. Freeman, Douglas S. Lee's Lieutenants. A Study in Command. 3 Bde., Scribners, New York 1942–1944. United States. War Dept. : The War of the Rebellion: a Compilation of the Official Records of the Union and Confederate Armies. Govt. Print. Off., Washington 1880–1901, online here. Young, III, Alfred C. Lee's Army During the Overland Campaign: A Numerical Study (Louisiana State University Press; 2013) 400 pages; argues that Lee's Army was far larger in strength and suffered much higher casualties than previously believed.